Washington’s Governor Jay Inslee recently announced his Democratic candidacy for the Presidency. 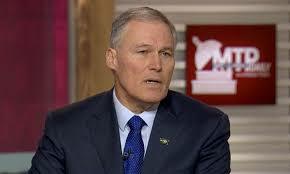 Inslee makes stopping ‘climate doomsday’ his feature issue. Sometimes the money is from donors — e.g., the multi-million dollar websites “US Climate Alliance” and Governors Climate Alliance — and sometimes the money is taken from taxpayers — “Pacific Coast Collaborative” and the the campaign to tell the “West Coast Story”. Inslee has used his Governor’s office to contract as a consultant for an environmentalist pressure group, World Resources Institute (WRI), in at least two agreements providing hundreds of thousands of dollars of private underwriting so that the group can essentially operate out of Inslee’s office and claim State authority for its agenda. Public records also show that [Inslee’s] Office is transferring hundreds of thousands of dollars per year in taxpayer money, including apparently a quarter of a million Washington State taxpayer dollars, to pay consultants . . . to promote climate advocacy.